Join our community based, monthly, Augmentative Communication Group! Group provides a peer interaction opportunity for parents and children who primarily use AAC “talkers” and is facilitated by a Senior Speech Language Pathologist. 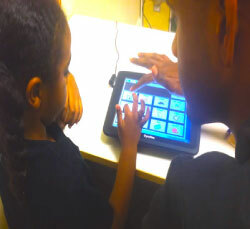 • Promote robust & authentic communication using AAC. • Showcase AAC usage & provide structured contexts to interact in a natural, community setting. • Provide opportunities to network, share, support & troubleshoot. See details in flyer attached. Must register in advance – spaces limited! Please consider sharing the attached flyers with anyone who may benefit and post within your community, school leaders, friends, families, clients, social networks, and list serves. Contact us with any questions! Look forward to seeing you in group!